sell stock back to company at higher price. This model had many delights of which perhaps the greatest was that you couldn&apos;t really, like, do damage to your reputation. The more annoying you are: the more the company wants to get rid of you! So the more they&apos;ll pay. And since you&apos;d really only get into this business if you had some natural predisposition to annoyingness, it was a nice way for some people to make a living doing what they loved. Sadly it sort of petered out after the 1980s, though you still see variants on it occasionally. It&apos;s fun to contrast Bill Ackman&apos;s 2,000-word letter to the J.C. Penney board referencing his previous "several-thousand-word email to the board outlining my concerns about our current trajectory" with Carl Icahn&apos;s 280characters about Apple. For one thing: those two tweets seem to have added seven JCPs to Apple&apos;s market cap. For another: they probably took less time to write? Apple is a company that could probably afford to buy back some more stock. And that&apos;s a strategy that you can think up between Dell court filings, and then go describe in a tweet. Meanwhile, good glaven, what is Bill Ackman doing with his time. Things! So many things! He resigned from the J.C. Penney board for, basically, excessive annoyingness, which freed him up to spend more time - I&apos;m going to guess that what he&apos;s doing right now is sitting at his desk pouring cookies-and-cream flavored diet-shake powder through a fine metal mesh, running a metal detector over it, and then calling DealBook with the results? Here you can read Lucian Bebchuk&apos;s claim that activist investors tend on the whole to improve the long-term operational performance of the companies they invest in, and here you can read Justin Fox&apos;s application of that result to defend Bill Ackman, pointing out that his job is to "identify companies that [he thinks] could be worth a lot more than their share price indicates, and push for changes." This paints a pretty noble picture of activist investors as deep-value investors informed by careful fundamental research and a real vision of how to make operational improvements at their targets, but one thing that you&apos;d expect with this model is that sometimes the activists would just be wrong about what changes to make. Which makes sense: it is hard to run a successful retail business, and there&apos;s no obvious reason that Bill Ackman would be vastly better at it than, say, the CEO of a big3 retail business. Obviously you can be wrong about capital structure too, but (1) if you are a corporate raider that is kind of your wheelhouse, unlike retail or diet-shake safety or whatever, and (2) it matters less. Would Apple be better off in the long run spending billions of dollars on share buyback or investing it in building a spaceship or whatever? is a legitimate question for an Apple CEO or director to ask. But, y&apos;know, the stock is up 5% because people want their buyback now. Buying a lot of stock tends to make its price go up, in the short term.4 You can tell that this strategy does not require endless research from Icahn&apos;s rather casual entry into Herbalife and Dell. Similarly, here is a Breakingviews column arguing that Ackman had to resign from the J.C. Penney board because if he "gets a reputation as a loose-cannon director, it will give him fewer options as an activist." Which I guess gives him fewer options as an activist at JCP? A reputation as a loose-cannon activist doesn&apos;t really hurt you in demanding a stock buyback. Remember Icahn&apos;s background as an &apos;80s raider, when a reputation for annoyingness was an unmixed benefit. "Make Carl Icahn happy" is a thing that a manager might say for reasons other than his reputation as a sweetheart. Joe Weisenthal asked today for a theory on why Icahn announced his Apple position on Twitter. My general theory of Carl Icahn has long been that his focus in investing has shifted over time from "making money" to "amusing himself," and since he seems to find media attention amusing, that dovetails nicely with the Twitter thing: if you&apos;re looking for media attention, it&apos;s pretty much all on Twitter.5 But of course media attention is good not just for self-aggrandizement; if your goal is to be annoying and keep your ideas constantly in front of Apple&apos;s directors and shareholders, the media attention can&apos;t hurt. And if your idea isn&apos;t simple enough to fit in 140 characters, refining it would probably make it more annoying. 1.Obviously I am speculating here and hope I&apos;m wrong because THAT WOULD BE AMAZING. Also Yglesias&apos;s suggestions for Apple include "build a hyperloop" and "relocate the entire company to a brand new Apple Technology City somewhere in Nebraska," which you could actually see Icahn being on board with? 2.Herbalife, for one. Dell is a similar success in a roundabout way: he pushed for a very large $14-a-share buyback and got instead a 23-cent-ish bump to the merger price. Still, you can count it as a profit. 4.TBF the Bebchuk study is not just about operational activism; it finds that even pure capital-structure monkeying produces long-term improvements. 5.Plus, like, ooh you&apos;re so innovative, being the first person to pretty much tweet your 13Ds, What Does It Mean, etc. 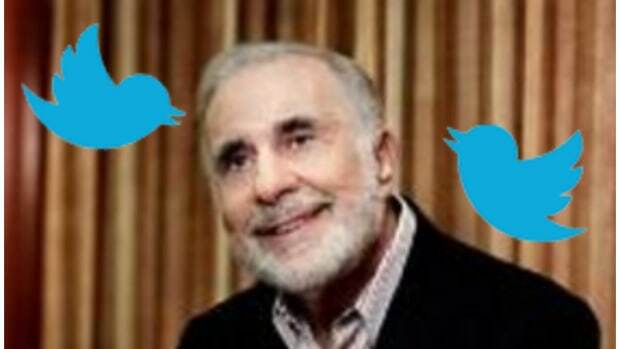 In which Uncle Carl Icahn learns that tweetstorms a grind, bruh.